So anyone who has submitted to microstock for more then a couple weeks already knows that one of the most popular styles of imagery offered here is the Isolated Model over white. While it is not horribly difficult it does take some skill to master and without a little guidance the trial and error involved in finding the right balance can be frustrating and time consuming. Like anything else in photography there are many different ways to arrive at the end product but at Vegas Vision Studios we use light to create our full body isolations. 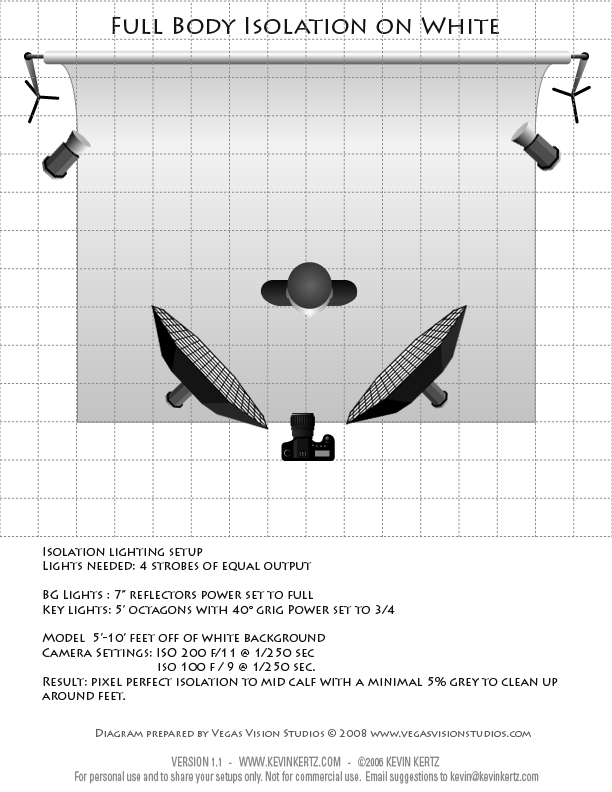 To get you started though here is a little diagram to show you how we light the average isolation set at Vegas Vision Studios. While the diagram alone won't give you everything you need it should put you well on the way to being able to get your head wrapped around one of the most popular styles of shooting in stock and commercial photography. Excellent article and diagram. Thank you. What do you use for the models to stand on? Thanks. Well for those who got no studio and make photos in a little room or outside, this isn't that useful, right? good blog and advice, good links too!! Thanks! 2.Color Range and or Replace Color when the background is all within a similar color range.